We are sad to unexpectedly lose a talented and loved member of our tight-knit glass community in Pittsburgh. We will miss Gary Guydosh. He was a pioneer and the first glass artist to follow his passion and open a glassblowing studio in Pittsburgh. Gallery G Glass opened in 1998 on Carson Street in the South Side. Gary later moved the studio to Lawrenceville on Liberty Avenue. Gary was an inspiration and a teacher, always with an open door to the community. He welcomed others into his studio so that he could share his enthusiasm for glass and encourage others to be moved as he was by the medium. 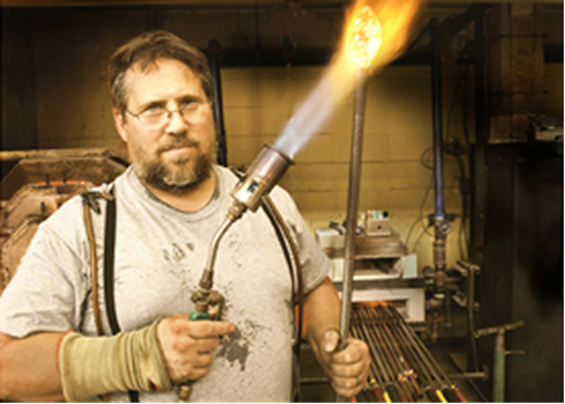 Gary, owner of Hot Block Tools, was also known amongst glassblowers as a toolmaker. He made blocks, paddles, and custom molds to help other glassblowers shape their creations. His knowledge of glass allowed him to make the best tool for the job and to understand the needs of glassblowers. Over the years, he focused on learning glass tradition and techniques, specifically classical Italian hand-blown glass and hot sculpture. His latest art combined two of his long loves with glass – steel and nature. His plant sculptures had an earthy and realistic feel that contrasted with their size and elegance.